If you have family members who developed cancer at any point in their lives, then your radar should be turned on. A new study found that even when relatives are diagnosed with cancer at an older age, it still means that younger members of the family are at risk of that same disease. We know that people who get cancer earlier put their family members at greater risk. But not much was known about whether hereditary risk comes into play when someone gets cancer well into retirement age. Swedish researchers tackled this subject in a study on nearly eight million people and their biological parents. The age of the parents was not limited, while the children’s ages stretched from infant to 76 years of age. The study’s time period was quite long, extending from 1961 to 2008. PLUS: More on genetics and cancer risk. They accounted for other risk factors that put you at risk of cancer, like diseases such as chronic obstructive pulmonary disease or habits like smoking and drinking alcohol. After these were off the table, they got down to brass tacks: genetics. The highest risk was seen where parents were diagnosed at younger ages. Yet, even if diagnosed above the age of 80, even 90, the risk of the same cancer in offspring was significantly higher than those whose parents were not affected. 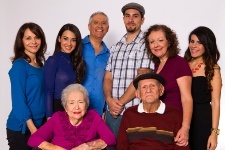 All in all, the majority of cancers in families occur at older ages. So, as the years go on, your risk of the cancers that have afflicted your family in the past rises. As you can see from the list above, prostate cancer is particularly dangerous within our genes. The researchers believe that family members may benefit from knowing that they’re at increased risk of a particular cancer, because it allows them to take action and avoid the risk factors for that cancer. “Familial risk of early and late onset cancer: nationwide prospective cohort study,” BMJ, 2012; 345: e8076.